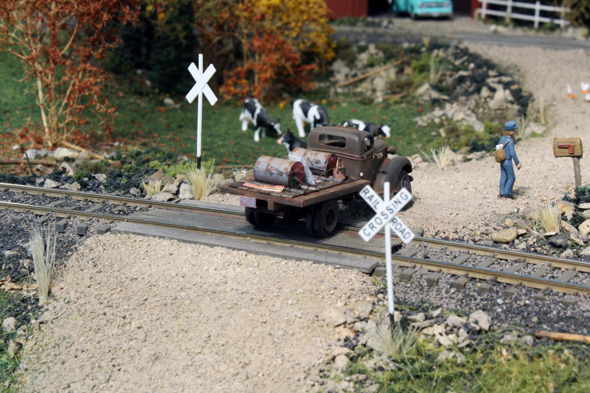 My second Sylvan flatbed better clear the crossing soon, I hear a whistle in the distance. 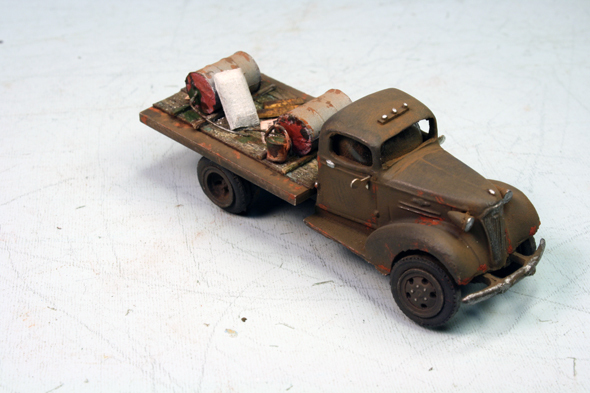 I had a second identical model of the Sylvan 1937 Maple Leaf 2 ton flatbed. I decided to built it as I finished off my first truck a few months ago. Easier to build a duplicate when all is fresh in my mind. 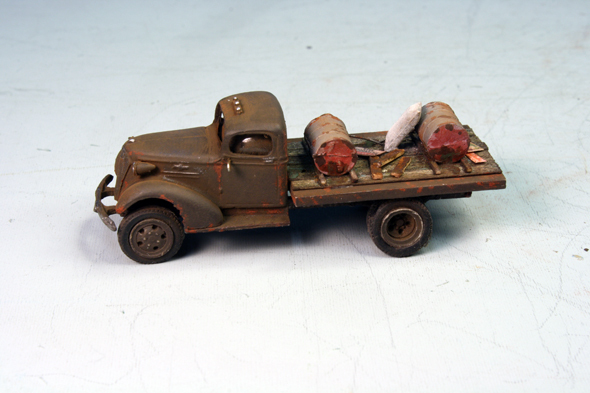 Once again the model went together really well although I left out the steering wheel and figure as in the first model. I painted my truck with Home Hardware camo olive green. The flat bed got some stripwood weathered which will hold the load. Acrylic silver is added to handles, grill, hubs and hood ornament. The tire area that would touch the road got a coat of acrylic chalkboard black...kind of an off black with a look of dark gray. 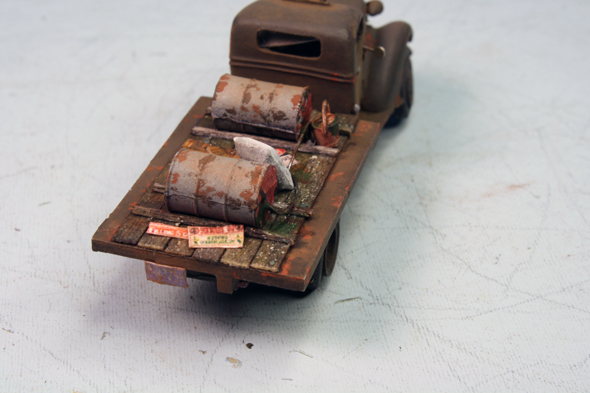 Once I added some acrylic rust paint spots I used PanPastel gray and Bragdon rust on the body, rims and flatbed edges. I added a couple of cast metal barrels, wood pieces, signs and hoses made from wire. I also threw aboard a Tichy sack which would maybe contain cement. Nicely built George. You impress me everytime you post one of your project. 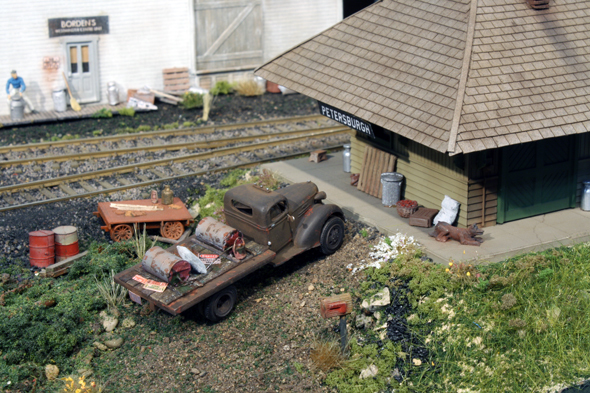 By the way, would you know anyone who might have any Rutland station plans that I would be able to use to scraftbuilt them in HO scale? I do have some of the Nimke books. Do you still have the plans you did for the Rutland Historical Society? If so, would you be ready to sell them? That would be great George.